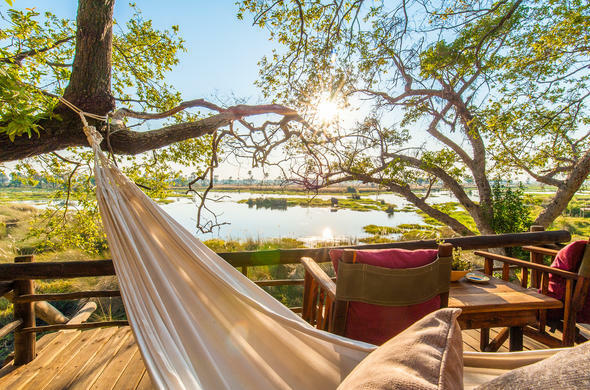 This intimate and informal safari camp is situated on a small island close to the southwestern edge of Chief's Island. The Okavango Delta is a shifting web of crystal clear channels, lagoons, sweeping flood plains and palm-studded islands. It hosts over 450 bird and 1 000 plant species. You will find Crocodile, Hippo, Elephant, Buffalo, several species of Antelope, the predators such as Lion and Leopard, and more. The Okavango Delta has earned its reputation as one of the world's premier wilderness areas. Delta Camp overlooks the Boro, one of the primary watercourses of the Okavango. The camp prides itself on personalised service and works hard at offering guests the opportunity to experience the tranquillity of the environment, while preserving the pristine beauty of the area. Fresh vegetables, cheeses, excellent meats and fine wines are flown in daily and lovingly prepared. This maintaind the camp's reputation for delicious cuisine. Dine in the dining room overlooking the sweep of the Delta, or take a beautifully prepared picnic onto one of the many nearby islands for a secluded and intimate experience. Children are always welcome, no age limits. Be aware however that children are inevitably more vulnerable in this sort of environment than adults.